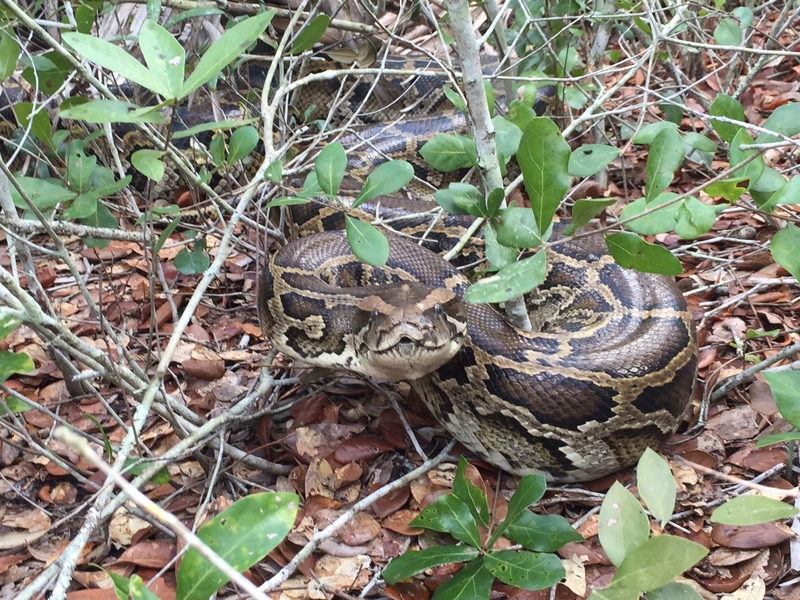 Burmese pythons are literally eating their way through the Everglades. With no natural predators, these invasive reptiles - imported from Southeast Asia as pets - appear to be wiping out most of the small mammals that once thrived in Everglades National Park. They are also chasing out other predators, who have to go elsewhere for a steady diet of rodents, mink, rabbits and raccoons. Scientists like Davidson College's Michael Dorcas have shown that the populations of mammals including raccoons, possums and deer has dropped dramatically in the Everglades. They strongly suspected the fast-breeding snakes were to blame, but it took a study out this week in the journal Proceedings of the Royal Society to confirm the link. In an ingenious experiment, scientists put radio collars on marsh rabbits and placed them in areas known to be favorite haunts of Burmese pythons. Initially the rabbits thrived and even bred successfully. But after nine months, the researchers returned to find that pythons had eaten 77 percent of the rabbits. In control sites outside the park, pythons ate no rabbits. "All of us were shocked by the results. Rabbit populations are supposed to be regulated by factors other than predation, like drought, disease," study co-author Bob Reed, chief of the invasive branch of the United States Geological Society, told CBS News. "They are so fecund. They are supposed to be hugely resilient to predation," he said. "You don't expect a population to be wiped out by predation." University of Florida's Robert A. McCleery, another author on the paper, said the evidence against the python was pretty damning: The radio collars, along with the rabbits, were found in the snake's belly. "Every one (of the rabbits) we are saying was eaten by a python, we found inside a python," he said. "It wasn't like, 'I wonder what ate this.' You are looking for your rabbit and you find a python. The radio collar was transmitting from inside the python." Reed and the other authors said the findings raised the prospect that "pythons have replaced mammals" such as coyotes and bobcats "as the dominant predators on things like rabbits" in the Everglades. It is too early to know exactly what long-term impact pythons will have on one Florida's most important ecosystems. Some species like birds and turtles may benefit from the demise of mammals but Reed and the other authors warned the ecosystem as whole will most likely suffer if the snakes continue to increase their numbers. "There is a serious ecological problem in Everglades National Park that appears to be spreading," McCleery said. "I know what mammals do. I know they change vegetation. I know they disperse seeds. I know they prey on other things," he said. "When you start taking these things out of the system, the vegetation could change. There could be outbreaks of things." Pythons were only seen sporadically as recently in the 1980s in the Everglades, a 10,000-square-kilometer freshwater wetland that covers much of southern Florida. But thanks to the pet trade, they started showing up in the 1990s and their numbers sharply escalated in the past 15 years to the point where Reed and others believe there could be as many as 10,000 there. With such a huge population, ridding them from the Everglades has proven almost impossible. Shooting or poisoning them, as has been done to rid rats from some South Pacific islands, is not practical in a crowded state like Florida. Trapping them has done little good and the use of dogs has not worked because most pythons are in swampy, inaccessible areas. Occasional hunts such as the annual Python Challenge have only put a minor dent in their numbers. "Right now, we do not have control tools that are likely to allow us to eliminate pythons from the Everglades," Reed said. "That means we may not see the recovery of mammal populations until some effective control tool is developed." The U.S. Fish and Wildlife Service has put eight large constrictor snakes including the Burmese python on a list that bars their importation into the country and trade across state lines. But for Reed, these types of measures are probably too late for the Burmese python. The best hope is containing them to the Everglades and preventing their spread to places like the Florida Keys. "For species already established in Florida, it's like closing the barn after horses have fled," he said of the federal measure. "But for the species not yet established, it really, really will reduce the chances of them entering the U.S. and establishing new populations." Dorcas agreed there are no control measures that show "any promise of suppressing the population across across its range." So the best hope, he said, is that the mammals themselves will adapt to survive against the new predatory threats. "One of the reason pythons have caused such dramatic declines in mammals is because mammals are naïve to pythons as major predators," he said. "So if that is the case and if there are mammals that do avoid pythons and that behavior is heritable, then we should see the fairly rapid evolution of mammals that would avoid pythons. Whether that will happen or not, we don't know."